We couldn’t be more excited to be joining the classrooms of Saint Cecilia’s Catholic school during the 2018-2019 school year (and hopefully, beyond)! Classes at SCCS are held during early release Thursdays from 2:15-3:45 on the SCCS campus. Registration will be sent home with students as class dates near, and registration is through the SCCS school administration. 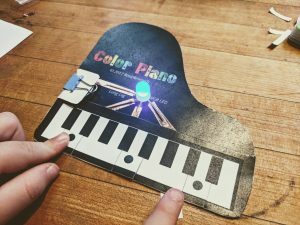 Students will learn circuit basics as we create LED projects with paper! Discover how strong of a bridge you can make, or save an egg from a tall drop! That was so much fun, I wish it wasn't over. Definitely one of the best mini-classes I've ever taken!